This review was originally written when Lingodeer was 100% free. They’ve since sectioned off some content to premium subscribers. It’s pretty cheap still but that does take away some of my enthusiasm. When it comes to free language learning apps, nearly everyone has heard of Duolingo and Memrise, but those aren’t the only options available. Lingodeer is a fairly new app which started by focusing specifically on Asian languages but has since expanded into several other languages. Lessons are taught in a manner that’s fairly similar to Duolingo but in a much more effective manner (at least for me). This is especially true when it comes to Asian languages. I’d previously tried Duolingo to study Chinese and was really shocked by how bad it was. Lingodeer is many times better for studying Asian languages. 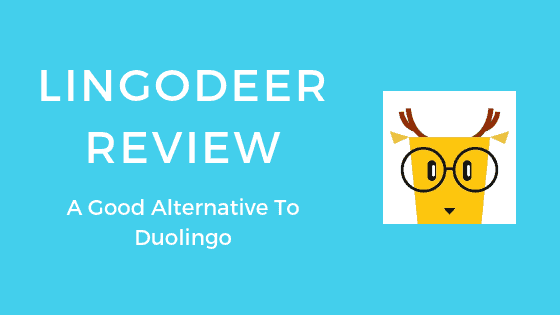 But even for languages like German, French, or Portuguese, I’d still recommend Lingodeer over Duolingo. This isn’t to say that Lingodeer is perfect or that it should be the only resource you use to study. There are still quite a few things that could be improved. I’ll get into those a bit later though. Currently, Lingodeer offers the following courses taught in English – Japanese, Korean, Spanish, French, Chinese, German, Portuguese, and Vietnamese. Additionally, there are courses taught in other languages. For example, you could take an English course taught in Korean, or a Japanese course taught in German. For this review, I decided to try out their German, Chinese, and Spanish courses. I’m fairly advanced in both Spanish and Chinese but am brand new to German. Lingodeer divides their lessons into different topics such as family, numbers, food, or health. Before that though, each language starts out by teaching the alphabet. While it sounds obvious that this is where you should start, it’s not always the case with other resources. For each language, I found the alphabet section to be quite comprehensive, perhaps overly so even. It goes beyond just the alphabet and looks fairly in-depth at the pronunciation, including things like word stress, exceptions, explanations, how to make the sound, and there are lots of words you can click on to hear the pronunciation. This section is a bit heavy but I’ve always felt like it’s worth spending a lot of time early on to master pronunciation. By itself, it may not be enough, but Lingodeer does go much further with teaching pronunciation here than you’ll see among other most apps. It may be smart to also use other resources like Speechling or italki to help you with your pronunciation. After (or before if you’d prefer) completing the alphabet unit, you’ll move onto the topic based units. This works pretty well, but like most courses that split up their content this way, occasionally you’ll learn some less important content before learning more important words. In the Chinese course, for example, you’ll learn the words for peach and pear before learning how to ask a question. Not a big deal. Taking this a bit further though, somehow the words for lawyer and robot showed up in the first unit labeled Basics of the Spanish course. Obviously, these words are far from essential for absolute beginners. It’d be better if they had more appropriate vocabulary early on. The German course did seem much more reasonable with what they taught in the beginning. The order of the units and content of the lessons does seem to vary depending on the language you’re learning. This is a good sign to me that they don’t simply replicate the content for each language like you may find with other resources. After trying Rosetta Stone, I got the impression that that’s what they were doing. In fact, Lingodeer does seem to differentiate the content a bit according to the language they’re teaching. For example, the Spanish and Chinese courses taught different foods that would be more suitable for each language. So, it seems like there’s at least some attempt (perhaps minor) to make the lessons culturally relevant. There are quite a few of these topic-based mini-units. At the time of writing, there are 60+ for each language and says that more are coming soon. Each unit contains between 2-5 lessons as well as some grammar lessons which are called Learning Tips. Additionally, some languages include a story at the end of the unit. If you’re not a complete beginner, you can jump ahead in the course by testing out of previous content. This is essentially just a test of the material covered where you’ll complete a bunch of exercises to prove that you know the content. You’re limited to three mistakes, if you make more than that then you’ll have to start over or complete the preceding lessons. There were a couple of minor annoyances I found with testing out. First, you have to test out of the units in order. So, if you’re more advanced, you may have to complete three or four of these tests to jump ahead to where you’d like to be. In reality, it’s not a huge deal. They’re fairly quick and if nothing else will be some review for you. Another tiny annoyance I had is that after testing out of a section, you still won’t be able to look at all of the lessons in that unit. Each of the mini-units will be unlocked, but only the first lesson of each unit will be accessible. So, despite testing out of the section, you still would need to complete the first lesson in a unit before trying the second lesson. It’d make more sense for all of the lessons to be unlocked once you test out of a section. For nearly everyone though, this isn’t likely to be a real issue. Chances are if you test out of a section, you won’t try going back to complete the lessons. You’ll likely just continue on with the course. Let’s now take a closer look at what’s included in each mini-unit. When you first open a unit on Lingodeer, you’ll see the first lesson. But, if you swipe left, you’ll find an incredibly useful section called Learning Tips. This section really is great. A lot of language learning resources basically ignore grammar. The justification is often that children don’t learn grammar when they first start. However, you’re an adult and learning the grammar is probably going to make your life much easier. They include lots of explanations and examples to help make things as clear as possible. Lingodeer has also clearly put quite a bit of thought and time into this. Each language requires different explanations here and it’s not something that can quickly be copied to other languages. Similar to Duolingo, the lessons are taught by completing lots of exercises. There does seem to be a bit more variety here though. The questions start out very simply before becoming more challenging. The large variety of question types helps in two ways. First, it makes things more interesting so that you’re less likely to get bored and quit using Lingodeer. Second, it tests you on multiple skills, helping you to be more well rounded in the language you’re learning. The questions work well together. Without a doubt, you’ll learn a lot by completing these lessons. Obviously, if you’re studying a language, you’re going to want to occasionally go back and review what you’ve learned before. Lingodeer does a good job here as well. There are a few different ways to review. The first way looks similar to flashcards. First, you’ll hear a sentence. Then, you can show the answer which includes both languages. Depending on how well you remembered the material, you’ll mark it as either weak, good, or perfect. Another type of review exercise is called the 5-Min Quiz. The exercises are all very similar to the ones you’ve previously completed. It works well as a nice refresher. You can also choose to review either vocabulary or grammar. While the vocabulary ones are pretty strictly vocabulary, the grammar will also include vocabulary. After all, it’s hard to practice vocabulary without also using some vocabulary. A nice option is that you can select the lesson you want to review. So, if some are easy for you, you don’t need to review those unless you’d like to. This section is quite a bit different than the rest of Lingodeer. First, it only seems to be included in a few languages – Chinese, Korean, and Japanese. For these languages, you’ll find it at the end of the lessons. It consists of a short video with captions. It’s somewhat related to the individual units but takes things much further. For example, in the Nature unit of the Chinese course, the story goes and includes the names of all of the planets. There are comprehension questions that go with the story. Additionally, there’s a speaking exercise in which you’ll record yourself telling the story. In the end, you can listen to yourself telling the whole story. It’s pretty cool and a fun way to expand upon what you’ve learned in the lessons. It’s just a shame that it’s not available in more languages. It’s free. While there are lots of language learning apps, there aren’t that many good ones that are free to use. Lingodeer doesn’t bother you with lots of ads and they don’t push you to upgrade to a paid plan either. It’s just a great free resource. Clear audio. The sentences are recorded clearly by native speakers. This may sound like a small thing but it’s not. One of my biggest issues with Duolingo is that the audio wasn’t recorded for full sentences. This makes it really choppy and unnatural sounding. It’s a small thing but hugely important and Lingodeer has done a great job. Good looking app. Although there are a few small issues with the app, for the most part, everything works well. The app has a sleek design that is intuitive to use. Variety of exercise types. An issue with a lot of language learning apps is that they use only a few different types of exercises. This can quickly become tiresome when you use it over long periods of time, which may lead to boredom and loss of motivation. Lingodeer challenges you in lots of different ways throughout the lessons. Clearly explained grammar. They didn’t skip over the grammar part like is so often done. They explain important grammar points much better than most competitors. Review opportunities. Lingodeer makes it easy to review everything you’ve learned or just parts of certain lessons that you may have struggled with. This is great for making sure you’re not forgetting what you’ve already learned. Sometimes the order things are taught doesn’t make sense. For the most part, Lingodeer does a good job of teaching useful language and structuring lessons that build upon each other well. But sometimes, the lessons include language that’s not useful for the level they’re at. The obvious example is the words robot and lawyer being taught in a basic Spanish lesson. There are a few small kinks in the app. While the app works well and looks great, there are still a few weird things that it does, such as, lessons loading slowly and not letting you take lessons you’ve already tested out of. Not sufficient for improving speaking skills. There are some speaking exercises on Lingodeer, but those won’t be enough to really develop your oral skills. A course like Pimsleur is much more focused on improving speaking ability. Additionally, finding a tutor on italki is an excellent affordable option to improve conversational skills. Finally, using Speechling to get feedback on your pronunciation could be really helpful. Will only get you so far. Lingodeer is an awesome way to get introduced and started learning a language but it won’t take you all the way to fluency. At some point, you’ll need to move on to other resources. Not enough languages yet. Lingodeer has actually expanded to new languages quite quickly but they still cover quite a bit fewer than more popular alternatives. I’m a big fan of Lingodeer. Although it’s not as well known as Memrise or Duolingo, it’s my favorite of the free language learning resources. They do a great job of making it easy for anyone to start learning a language. They provide a familiar learning experience but improve on the weaknesses of many other apps. The fact that they provide so much content for free is really impressive. Lingodeer is an excellent resource. That doesn’t necessarily mean it’d be the best option for language learners or my first choice personally. The fact is that there are a lot of quality resources out there. The best option often depends on the language that you’re learning. Thank you , Gracias, Dank jij wel x100 for your review of these Spanish learning tools. It is so confusing and overwhelming to find a good program. I was so happy to read your honest reviews of the various programs I WAS interested in. I was going to go with SpanishPod 101, but found they had too many scattered pieces of matierial all over the place. I did like their podcast and listening comprehensive exercises. So after reading you reviews, it looks like I will go with Baselang, as I have the extra time to take plenty classes to benefit from it’s “unlimited” offerings. Also I insist on a strong curriculm because I have always been a “class room” learner and believe in learning Spanish basics and not just “phases.” I will be sharing this site with others…My sincerest thanks! Thanks a lot for taking the time to leave a comment. I’m sure you’ll find your Spanish improving quickly with Baselang!